SPRINGFIELD, OH --(Marketwired - March 30, 2016) - Global lifting solutions provider Konecranes serves the wood industry with a complete portfolio of lifting equipment and services. Lift trucks are a strategic part of the offering, with decades of experience reflected in the special features of these machines. High uptime, high performance, low fuel consumption and highly evolved ergonomics for the driver's comfort are some of the top features found in Konecranes lift truck line, typically supplied to sawmills in capacities ranging from 10-16 tons, and sometimes higher. Operator cabins demonstrate best-in-class ergonomics, superior visibility and low noise levels. An excellent visibility lifting mast and fork carriage with no crossbeam to obstruct the operator's view improve safety and boost efficiency. The machines also feature lever or mini-wheel steering and air-cushioned seats for driver comfort, plus protected walking areas on the fenders. If needed, a service ladder can be attached to the side of the outer mast to allow operators safe access to high loads. But ergonomics are not the whole story. Konecranes also builds special lifting appliances for sawmill operations, from handling wood packs in warehouse operations to shipping finished goods, such as loading sawn wood bundles onto rail cars. A complete range of quick-change fork/carriage combinations, fork/shaft systems and attachments are available for various jobs. 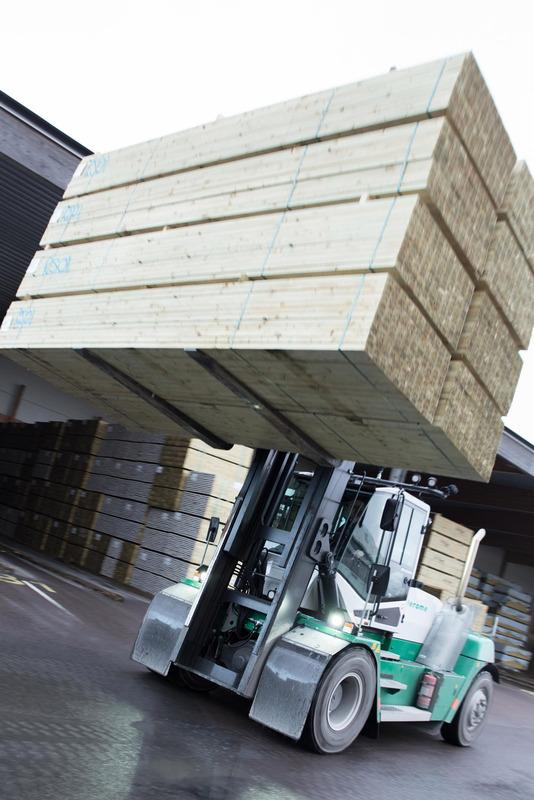 For example, thin fork blades, a short wheelbase and small turning radius help drivers move sawn products in tight spaces, lifting two to four wood packages at a time. A center leveling carriage can be rotated as much as five degrees left or right to level the load according to the ground conditions. As one of the world's largest suppliers of lifting equipment, Konecranes also delivers significant added value through its innovative service technologies and the world's largest service network. Case in point, TRUCONNECT®, Konecranes remote fleet monitoring, has become a trendsetter in remote, online monitoring for heavy lifting equipment. Recent upgrades deliver a brand-new world of monitoring services to customers. TRUCONNECT® for Lift Trucks is capable of providing Konecranes lift truck owners with information regarding live monitoring tire pressure, abnormal shocks on the machine, amount of hydraulic oil particles and water content, as well as fuel consumption and speed spectrum. "TRUCONNECT Remote Monitoring enables management to track the actual usage of its lift trucks in real time through a remote connection, effectively raising the bar for all lift trucks in the future," says Phil Stevens, Konecranes North America region director, lift trucks. "It is a great tool for scheduling your lift truck fleet's maintenance actions and improving the fleet's uptime, along with monitoring safe usage." According to Stevens, Konecranes also offers sawmill customers one more valuable option -- the ability to costume a new lift truck purchase to suit their needs and wishes. "We feel sure that our customers will appreciate our new operational features and technologies," says Stevens. "And now we know they'll even like the color!" In 2015, Group sales totaled EUR 2,026 million. The Group has 11,900 employees at 600 locations in 48 countries. Konecranes is listed on the NASDAQ OMX Helsinki (symbol: KCR1V).